Click here or on the image to the right to download our FREE 20 Tips To Save You Money This Heating Season. Looking to save money on heating your Maryland home this winter? 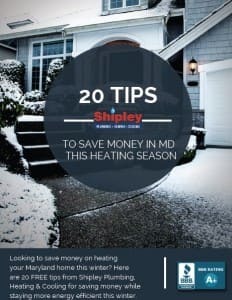 Here are 20 tips from Shipley’s heating professionals that will save you money while keeping you comfortable and more energy efficient this winter!